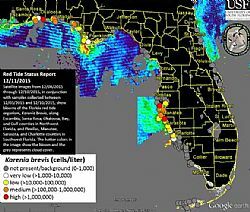 Based on the most recent available satellite images and analysis of water samples, blooms of Karenia brevis, the Florida red tide organism, persist along Escambia, Santa Rosa, Okaloosa, Bay, and Gulf counties in Northwest Florida and Pinellas, Manatee, Sarasota, and Charlotte counties in Southwest Florida. Very low concentrations were also confirmed in Lee County and one sample collected alongshore of northern Collier County contained background concentrations. Fish kills and respiratory irritation continue to be reported in bloom areas in both Northwest and Southwest Florida. Forecasts by the USF-FWC Collaboration for Prediction of Red Tides show western movement of bloom waters along Escambia and Santa Rosa counties and eastern movement of bloom waters along Gulf and Bay counties in Northwest Florida. Forecasts show offshore movement of surface bloom waters and inshore movement of bottom waters in Southwest Florida. This information, including maps and reports with additional details, is also available on the FWRI Red Tide website. The website also provides links to additional information related to the topic of Florida red tide including satellite imagery, experimental red tide forecasts, shellfish harvesting areas, the FWC Fish Kill Hotline, the Florida Poison Information Center (to report human health effects related to exposure to red tide), and other wildlife related hotlines. To learn more about various organisms that have been known to cause algal blooms in Florida waters, see the FWRI Red Tide Flickr page. Archived status maps can also be found on Flickr.